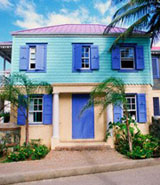 Taxes on Residents' Income from Property in British Virgin Is. There are stamp duties on certain transactions and tax on employment income in the British Virgin Islands, which is an overseas territory of the United Kingdom. Payroll tax is levied on employment income. Employers and employees are both liable for this tax. Employees are taxed at a flat rate of 8%. The first US$10,000 is tax-free. Employers are classified into two categories: Class 1 employers and Class 2 employers. Class 1 employers are small businesses employing seven or less people with a payroll not exceeding US$150,000 and a turnover not exceeding US$300,000. Class 1 employers are only liable to pay 2% tax. Class 2 employers are small businesses with a payroll exceeding US$150,000 and a turnover exceeding US$300,000. Class 2 employers are liable to pay 6% tax. Hotel accommodation tax is levied at 7% on the gross rent of properties leased for a short period of time (less than six months). Long-term rentals (over six months) and leasing of properties to British Virgin Islands´ residents are not liable for this tax. Stamp duty on lease agreements depends on the status of the tenant; whether he is considered to be a belonger (national) or non-belonger (foreigner). The base is the total rent for the duration of the lease. There is no capital gains tax or inheritance tax in the BVI. Stamp duty on property transfers depend on the status of the buyer; whether he is considered to be a belonger (national) or non-belonger (foreigner). The base is either the sales price or the market value of the property, whichever is higher. Land tax for non-belonger property owners (foreigners) is generally levied at US$50 per acre. Belongers (nationals) pay land tax at reduced rates, compared to non-belonger property owners (foreigners). Building tax is imposed at a flat rate of 1.5% of the assessed annual rental value (ARV). This tax is payable every 01 September annually.